We are using J3.2.3 on one of our client's website, which is an online casino website. The website is not live yet, as it is in development mode. Today we noticed that the server is too slow, though it's a dedicated server. After digging into the server we understood that there are a lot of requests coming from various IPs, bots, etc. We can definitely block the IPs using Ubuntu tools, but this is not a solution. We should use a method to first detect them, then to block them, but at the same time not to block the real visitors. Question 1: Is it dangerous to have this much page requests? Question 2: Is there a way to reduce the number of requests? Question 3: Which is the best way to protect my Joomla website against the bots, DDoS attacks, etc. If you are using Cpanel or any other linux distribution I would highly suggest using http://configserver.com/cp/csf.html and configuring it. It will reduce the amount of bots that are hitting your server and using up your resources. Cloudflare - great service. The bogus requests never make it to your server and their caching will save you considerable bandwidth. They filter the vast majority of bad requests. Admin tools or RS Firewall - Many sites you can block most countries other than your target audience. They can also automatically block IP addresses that are repeat offenders. Jsecure or similar plugin - changing the URL to the admin site is easy insurance. There's nothing to attack if they can't find the page. This protects your sites in multiple ways. Most attackers won't bother with your site if they hit a couple of roadblocks early, there are too many other insecure sites out there to spend a lot of time on one site. Unless they are specifically targeting your site, you should be good. You can also run jSecure on your site, it's a simple component that moves the administrator login to something other than /administrator/index.php. It can also redirect requests to the old admin page to something like a 403 page and has some basic IP auto banning functionality. It's a small change but I find it greatly reduces the number of bots requests on a site. There are components that can help with this. sh404SEF by Anything Digital has the ability to monitor, throttle and block requests based on a preset config that you define. I think Akeeba Admin Tools Pro allows this as well. If nothing else, you can always view your server logs in cPanel and add blocking config to your site .htaccess file. 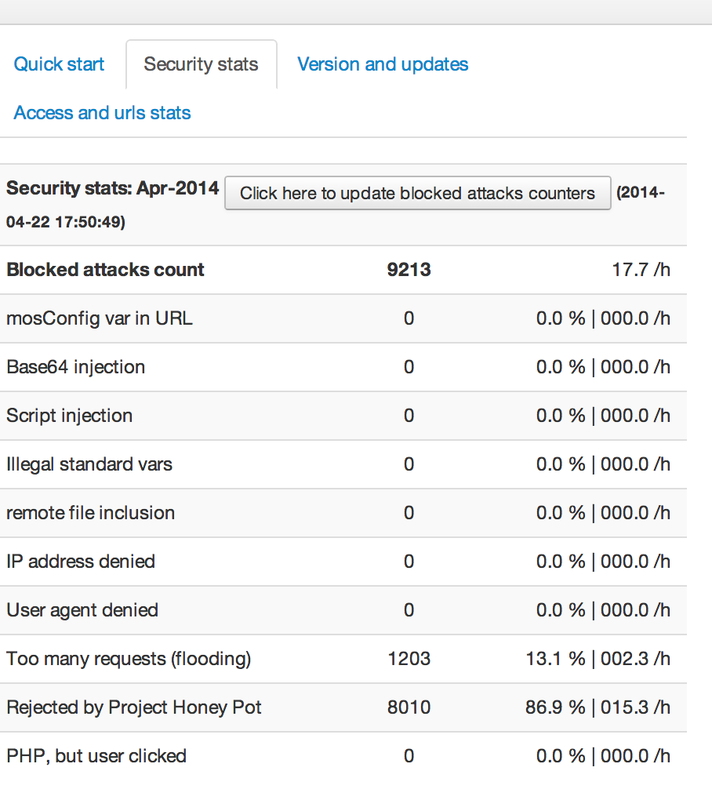 Project HoneyPot is a great idea that worked well until the spammers figured out how to get around it. I am continually blocked by Project HoneyPot because I have a dynamic IP that has apparently been used by spammers about 2 years ago. I now refuse to use websites that use Project HoneyPot. It's not worth my time and effort to get my IP unblocked almost every day. You will be blocking a great many legitimate users if you continue to use it when you are in production. If you have admin access to your server there are definitely better ways to do this. Not the answer you're looking for? Browse other questions tagged sh404sef security or ask your own question.